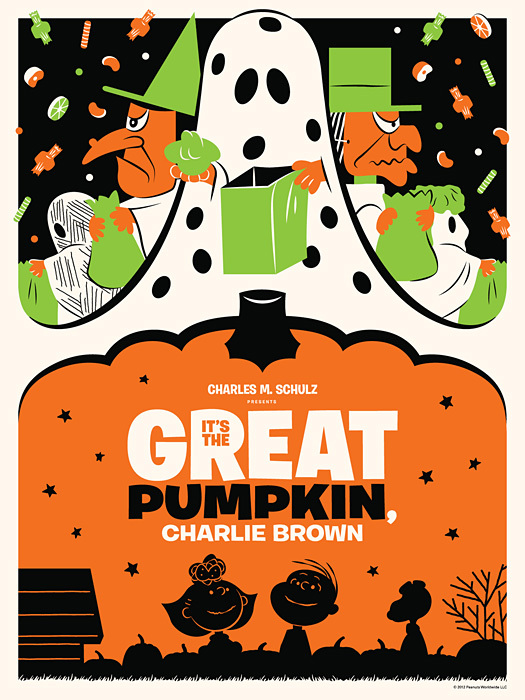 The fine folks at Dark Hall Mansion are back with two new limited-edition prints celebrating the television special It's the Great Pumpkin, Charlie Brown. The two officially licensed prints, created by artist Michael De Pippo, capture the essence of the special in a style reminiscent of classic TV listing ads. 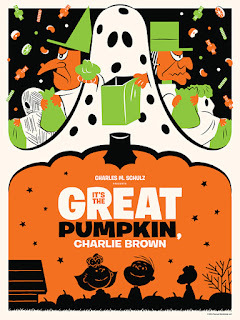 The standard print is inspired by the "I got a rock" scene, while the "variant" print recalls Sally expressing her frustration with Linus after the non-appearance of the Great Pumpkin. Both versions are 18" x 24" hand-pulled screenprints and numbered to reflect their limited quantities. 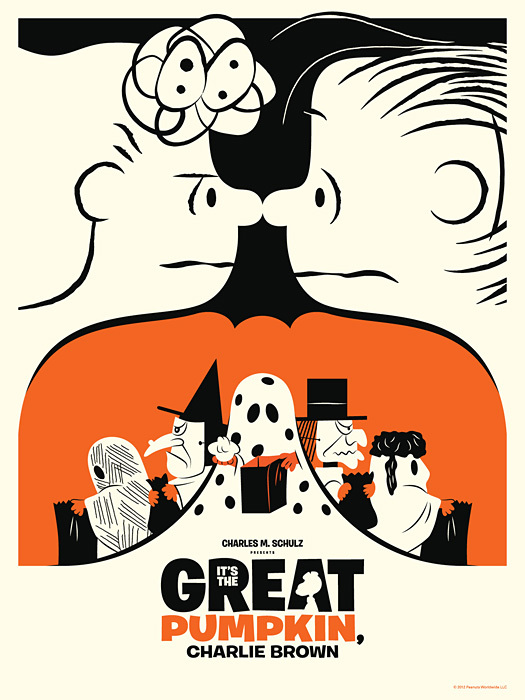 The standard edition is limited to 280 prints, and the variant is limited to 50 prints. In addition, there will be a special run of 10 of each style printed on wood (maple for the standard edition, fir for the variant edition). The prints go on sale Tuesday, September 18, 2012 at 9:30 AM (Pacific time) at Dark Hall Mansion's webstore. 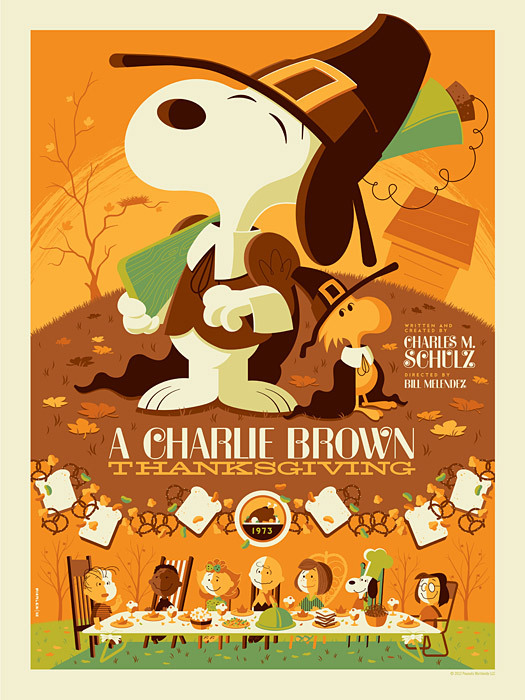 Previous limited edition Peanuts prints from Dark Hall Mansion have sold out quickly, so if you're interested, order promptly. For more information and for larger pictures of each poster, visit Dark Hall Mansion's blog. Mutts, created and drawn by Patrick McDonnell, follows the lives and thoughts of fellow pets Earl the dog and Mooch the cat, their owners, and a variety of animal friends. 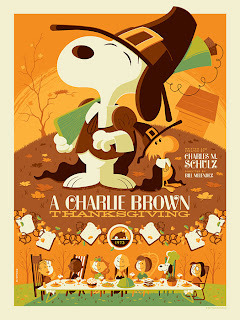 Patrick McDonnell has always been a strong supporter of Schulz and Peanuts. 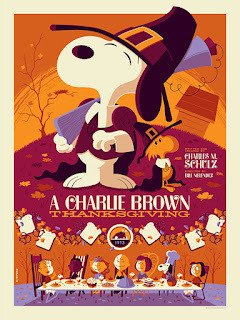 He's appeared at the Charles M. Schulz Museum several times, curated an exhibit for the Museum, and in 2000 organized a "Peanuts tribute day" among fellow newspaper cartoonists to commemorate 50 years of the Peanuts comic strip. 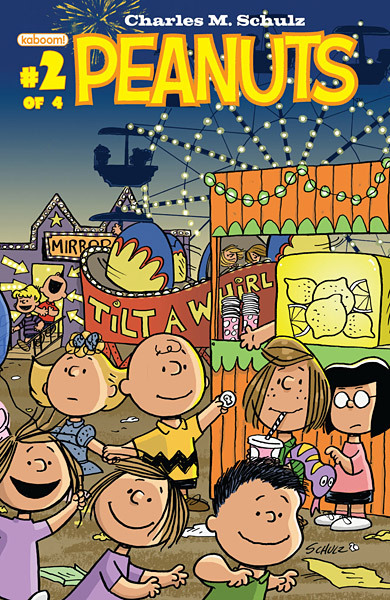 Charles Schulz was likewise known to be a fan of McDonnell's work on Mutts; in his foreword for the first Mutts strip collection, he said "Mutts is exactly what a comic strip should be." So be sure to check out Mutts every day next week - if your newspaper doesn't carry the comic, you can read it online at selected newspaper websites (those that use "Comics Kingdom" for their online comics), or at the official Mutts website.